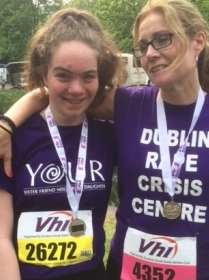 Walk, Jog or Run in the Vhi Women's Mini Marathon 10k in Dublin, Sunday 3rd June 2018 and raise money for your chosen charity. Page Name : The Valentine’s go running! Page Name : yH Mini Marathon Team! Page Name : Aisling Vhi women's mini marathon 2018 for hand in hand. Page Name : Helping Our New Ears support deaf kids! Page Name : Alzheimer's - Remembering those who cannot.